Understanding the hydrologic and socio-economic impacts of environmental and policy change in agricultural regions requires knowing how farmers react and adapt. We are developing transformative decision support tools that allow policymakers and natural resource managers to understand the incentives that drive farming decisions and adaptations to changing conditions in Montana’s agricultural regions. This project incorporates three major innovations: 1) The use of advanced satellite observations of agricultural productivity and water use to guide predictions of land and water resource allocations; 2) recent advances in data-model blending algorithms and data assimilation methods that permit recursive model calibration and improvement as new data become available; 3) coupling of state-of-the-art agro-economic and hydrologic models that can accurately predict agricultural activity and its impact on regional hydrology. These innovations are applied within a satellite-guided hydro-economic modeling framework that captures previously undocumented constraints on agricultural and water resources planning. The resulting framework is being used to understand farmer reactions to drought, policy, and other risk factors at both field and county levels across Montana, which is representative of the broader agricultural system of the interior western USA. The role of NTSG in this project is to develop new satellite based capabilities for mapping and monitoring of field level cropland productivity and water use changes, including evapotranspiration and agricultural yields, for the major Montana crop types and agricultural regions. Our approach leverages information from global operational NASA satellites, which allows us to extend our observation and model framework over multiple years and larger domains, including the continental USA and other major agricultural regions. Guan, K., J. Wu, J.S. Kimball, M.C. Anderson, S. Frolking, B. Li, C.R. Hain, and D. Lobell, 2017. 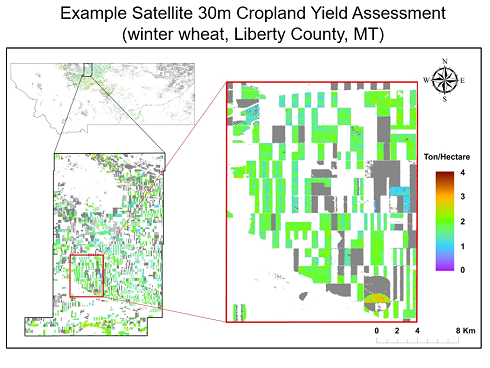 The shared and unique values of optical, fluorescence, thermal and microwave satellite data for estimating large-scale crop yields. Remote Sensing of Environment, 199, 333-349. He, M., J.S. Kimball, M. Maneta, B. Maxwell, A. Moreno, S. Begueria, and X. Wu, 2018. Regional crop gross primary productivity and yield estimation using fused Landsat-MODIS data. Remote Sensing, 10, 372.